creating actual relationships through artistic practice. This is a unifying theme throughout Greene’s past projects. 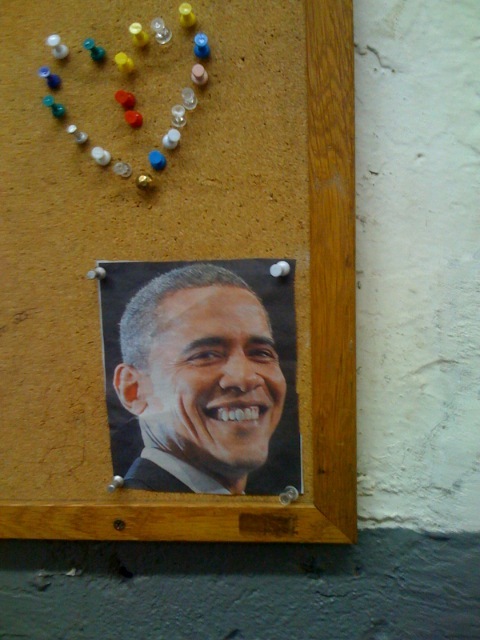 On the evening before the New York presidential primary, as I left my studio, I was greeted by an installation on a community bulletin board. I was immediately captured by the spontaneous gesture of the piece – its good will and hope, and how readily those states resonated with what I was feeling about the following day. I took a picture of the piece, and have reproduced that image on 5,000 postcards. I’ve bundled the cards in groups of 5 in 1,000 envelopes. 1. Please send the 5 cards (postage is already affixed to each card) to 5 people you know in various parts of the country. Range far and wide. I would be most happy to see these cards make their way to all 50 states. 2. You will note that on the back of each card, the recipient is instructed to take the card and post it on a community bulletin board (at a day-care center, retirement home, store, lamp-post, workplace lunch room, library…). And, if they are able, to take a picture of the posted card with a digital camera or the camera in their phone, download the image, and send it to kencorbett [at] earthlink [dot] net, along with a short note detailing the card’s new location. I plan to collect the returned images as a book along with a short essay on the psycho-political action of hope, and the work of community art. In 2008, Dark Matter is all around us. Us artists, us activists, us outlaws. All of us, we are engaged in a culture war and economic struggle against establishments in all their guises. We form communities to counter the alienation of everyday life, and the commercial and institutional structures that stifle reality. We desire another world. And we're not alone. As artist-activist Greg Sholette says, "a hidden social production has always found its own time and space apart from hegemonies of power and the objectifying routines of work. This dark matter resistance extends well beyond conventional conflicts between labor and capital to form a murky excrescence of affects, ideas, histories, sentiments, and technologies that shift in and out of visibility like some half-submerged reef." In 2008, we think it's time for things to shift. It's time to re-ignite dormant forces within the murky worlds of radical culture. It's time to dive. And how? From April 17-27 (11 days), we are gathering to celebrate, identify, discuss and act on the workings of Dark Matter. Version>08: DARK MATTER will showcase emerging, progressive trends in art, politics, technology and music. We'll gather and see how our peers in the counterculture create work, spaces, tactics and strategies. We'll witness multiple possibilities for the future, and leave ready to act. Please visit http://www.lumpen.com/V8/theme.html to see what we are looking for and submit your project. We are at the end of some cycles of resistance while others continue; the globalization movement has peaked for now, we also realize the serious limitations of counterculture. Thus with no illusions, we are given a new opportunity to clearly address the enormous crisis that we face. With a fresh-face for experience we can frame questions and histories that will help inform the new cycle of resistance we have yet to imagine. We also know that by assuming that the crisis is already upon us, we are a step ahead it the game by acting now instead of worrying about when it will arrive. Submission proposals are due by February 20th. If you would like to participate in the Anti-war overview tell us right away. Submission proposals need be no longer then a paragraph or so of description. The Journal is looking for articles theorizing or describing art and cultural projects with a radically transformative intent. We are looking for projects that privilege maintenance over spectacle, regeneration over intervention, regionalism over trans-nationalism and altruism over strategic thinking. We are interested in finding projects that involve one or several constituencies or can be classified under the aesthetics of doing and caring and loving. Descriptions of long-term committed projects are welcome, as are articles that talk about self-organized economic models and articles that normalize our dreams. Bring it on! We are seeking essays that productively theorize, criticize and analyze contemporary radical cultural production. In this section, we hope to directly support culture produced to confront or circumvent the issues facing us today (global warming, environmental racism, war, economic injustice etc…) buy publishing essays that either broadly or specifically analyze or give language to contemporary resistance and invention. To that end, we seek projects that squarely identify key concepts involved in these issues: the spirit of these essays should be as in a gift to others to better understand or to create tools which we can live by. 0. Countering the propaganda of fear (as articulated by government and media, e.g. in relationship to issues of immigration, the war on terror). Responding to depression or paralysis as a tool for or political/cultural movements. 2. Discussing/critiquing/analyzing web 2.0 as political tool. Flash animations, social networking, etc. 3. On the individual and collective responsibilities (ethics) of political artists. 4. The aesthetics of solidarity- what does mutual aid look like and how is it built? 5. Normalizing counter-hegemonic assumptions- how to shame bad things and support good things. 6. When to employ inflated or dramatic or scurrilous rhetoric. 7. Something on the nature of most “political culture” as created by movements organizations not having the pizzazz worthy of a museum exhibition… and how that’s great. 8. Academia and the Fine Art World- when are these institutions collectively useful and not just personally rewarding? 9. Something critical of the space between the anarchist moment and the nature of mass media. 10. An essay exploring the distance between state-side activism and wars overseas. 12. We are looking for essays that explore the relationship between fine-art practices and anti-war action. Additionally we are interested in printing something regarding Los Angeles’ historic Mayday 2005 LA march and general strike. We are also interested in printing something that analyzes art production under the NEA versus in a way to highlight distinctions between that period and the even more neo-liberal model of art today. We always appreciate your comments, suggestions, ideas and feedback. Be in touch. Look below to get off this list. We finally got a real list serve service (thankfully). The first installation of the Public Love Project will be held at The Shop at Bluebird, bringing together the curious and combustible chemistry of legendary Love Artist Kathe Izzo with the infamous Welsh Performance Artist Paul Hurley, loving each other a continuous live performance. The two artists, with a minimum of prior contact, will live in love together in public residence for 10 days at The Shop @ Bluebird. Living in a bedroom designed especially for them within the store, spending every waking (and sleeping!) hour together, practicing and nurturing their deep and growing affection for each other publicly and sharing that love with the viewing (& shopping public). Their subtle goal: to provoke spontaneous love within all participants and inciting a Love Movement reaching out across the expanse of London and perhaps the world . . .
Vascillating somewhere between John & Yoko's Bed-In and a somewhat twisted version of Jane Fonda & Robert Redford's newlywed bliss in Barefoot in the Park, both Izzo and Hurley will be available for private love appointments at their bedroom at Bluebird throughout the installation, either together as a couple or individually. The Independent School of Art would like to invite you to submit work for consideration in the 2nd issue of its publication SATELLITE. Each issue of SATELLITE revolves around one person. This person is not revealed by name, but through a series of responses to the many aspects of their life. The publication is structured as follows: A person, real or fictional, is chosen as the central conceptual hub. Only topics directly related to this person (their occupation, nationally, particular interests, historical events, cultural significance, collaborators and friends, etc.) will be the subjects for submitted materials. The person's name will not be included in the issue. The subject of this upcoming issue is JIM HENSON. This means that any subjects directly related to Jim Henson are up for consideration. --these include but are not limited to: childhood development, puppets, latch key kids, fine sports cars, John Denver, special guests, beards and stashes, dark fables, roommates who live in one room, neighborhood characters, geographic speciation, extreme personality types, morality tales, inter-species relationships, variety shows, bacterial pneumonia, letters and numbers, anthropomorphism. At this point we just need a proposal for content. Pick a Jim Henson related satellite topic (from our list or your research) and tell us how you would approach it. A short paragraph description of content would be best. If you have other writing or image samples of previous work please include them. None of the material need be related to art, and none of the material can directly speak of Jim Henson. We encourage all forms of writing: including essays, fiction, interviews, letters, reviews, etc. Short articles (750-1000 words) long articles (1500-3000 words). We also will accept images (image folios), including photography, drawings, prints, image/text projects, etc. This eventual 50 page, four-color, perfect bound issue will be distributed for sale in local and out-of-town bookshops, art venues, and online through our website. This will be a thoughtful, well-edited, reader-friendly publication. DEADLINE: Friday March 18th is the last day we can accept proposals for articles. and I invite you to attend this premiere in the flamboyant privacy and intimacy of your own bed, studio, kitchen, cafe or coffee shop, whereever it is that you take in your internet. Written in a blog format, www.mettaartlove.com is a chronicle of my newest and most difficult exercise in loving as art, loving the art world, starting with those artists and art institutions that I find most or more difficult to love. Beginning with a trip to the Guggenheim to pray and love Marina Abramovic during her cover version of Joseph Beuys "How to Explain Pictures to a Dead Hare" I propose to take a year of my life to meditate and project as much love as I am physically and spiritually capable of to as many artists and institutions as possible. By reading my writing and viewing the accompanying pictures, you will all become my accomplices in this venture and hopefully, within this year's time and in the ensuing years, we will all -- artists, fans, press, administrators and entreprenuers -- will be able to reap the rewards of a rehabilitated art presence in our lives. One can only hope. Please spread the link to www.mettaartlove.com generously and expansively and contribute whatever you feel you must, either here or on the site. :: Jonathan Osofsky aka peacock!revolution!is!our!revolution! Be Something announces the first biannual one2one festival, taking place at private and public locations throughout Manhattan and Brooklyn. A small and intimate participatory performance festival, one2one is based on the concept of direct energetic transmission of the artist to the audience and back again. All performances are designed for an audience of one (or in very special situations, a pair of close friends or relatives). A combination of the sweet, the provocative, the awkward and the seductive, one2one offers approximately 30 individual appointments for the entire festival. In most cases, performances run consecutively throughout the day. Appointments for individual performances can be made through [email protected] or with the individual artists at the email addresses listed below. A closing party will take place in the early evening, open to participants and general public. Location TBA, DETAILS TO FOLLOW ON THE BE SOMETHING WEBSITE. A full catalog of one2one is available at the Be Something website (www.besomething.org). Full-size images available upon request. BE SOMETHING: Initiated by Kathe Izzo and Sal Randolph , incorporating a rotating/morphing roster of artists, and born out of the spirit of intense friendship, BE SOMETHING is action as love. BE SOMETHING is thought process as neighborhood. BE SOMETHING is provocation as invitation, where art viewing becomes art making and the rest is history. A prototype for flamboyant collaboration that is as old school as it is revolution, BE SOMETHING is a rendezvous portal for participation and everyone is invited. Meet with me and I will give you a sum of money, and a choice. Ten appointments are available. In appointments lasting approximately one hour, I will teach you how to focus your love through your gaze to maximum effect, even at great distance. In addition you will receive the benefit of receiving my unconditional love the entire time, with all that entails. Conceptual performance artist Kathe Izzo has loved the world, one person at a time (for one day, one hour, one afternoon, evening or morning) for the last four years through her True Love Project (www.trueloveproject.com). In the past year, her work has been presented through Queer Up North (UK), Artemis (Miami), Cinders (Brooklyn) and Experimentica (Cardiff). To this date, she has loved over 200 people, with only a few disgruntled patrons. She is currently at work on her memoir, LOVE ARTIST. Guests are invited to attend the performance one at a time, and sit with me in silence in my kitchen. There is no prepared "performance act" that takes place, rather a collection of incidental sounds and movements that arise naturally as visitors enter and leave the space. When a new guest arrives, the present guest should leave. Visitors may come and go as often as they like. Composer Michelle Nagai uses conceptual, physical and sonic elements to create site-specific performances, radio broadcasts and installations. Her solo work has been presented throughout the US and Canada and has been supported by the American Composers Forum, Harvestworks, the Jerome and McKnight Foundations, Meet the Composer and Rensselaer Polytechnic Institute. She is a founding member of the American Society for Acoustic Ecology (ASAE) and holds a certificate in Deep Listening from the Deep Listening Institute. Join me for a destination-less ride of NYC's subway using chance, intuition and fate to determine our route through NYC's underground transit world. Millions ride it everyday as necessity without thinking but you've never experienced a ride like this - part choose your own adventure and part situationist drifting: we will get lost in the urban labyrinth and flip the everyday on its head. sto is an art and situation maker, gallery owner and janitor. He has been known to get lost a lot, make messes, gather people together, and subsist on coffee and beer for lengthy periods of time. You plus me plus morrissey divided by art history multiplied relationally equals talking and singing and feeling ridiculous but maybe just maybe a spark of something more and you and I and the music of the smiths will equal peacock!becoming-revolutionary!love!machines. I invite you to invite me to spend an afternoon together listening to the Smiths. We will share our innermost feelings surrounding the music-the lyrics, instrumentation, imagery, emotional and psychological resonances, memories, everyday and theoretical implications, nostalgias. If we're lucky something will be produced. Jonathan Osofsky aka peacock!revolution!is!our!revolution! is an artist who likes peacocks, dandies, armed militants, the smiths, deleuze and guattari and the unlikely sexual congress of apollo and dionysius very very much. In a private, neutral space, I will introduce myself and familiarize you with the equipment and cameras I regularly use to take portraits. For the rest of the time you will take on the roll of the photographer, using me as your subject in any way you see fit. Feel free to bring costumes, props, etc., remembering that it will only be the two of us in the performance space. New York City based artist, John O received his MFA from Hunter College. Recently returning home after spending one year in South Africa, He has taken photos for years and constructs objects and installations from these photos. Family, friends, and his immediate surroundings, as well as the systems and networks that define these relationships inspire his work. a little bit about their daily lives by filling out a form on the web. I believe that the consequences are significant. and it will only take a few minutes of your time. unconditionally and with unmitigated passion. walking around, depending on the participants’ specific “needs” and "desires." or just stop by and visit! give away. Please come and bring a container for your world or just come, learn and help! If you'd like to have your work posted in this section, please send material to talk [at] intheconversation [dot] com & mention that you would like it posted on the site. Artists statements and texts which directly relate to experiential, participatory, and situational art are welcomed.